For years, Southern Utah University’s Aviation program has worked toward changing an outdated Federal Aviation Administration (FAA) regulation for aircraft maintenance training curriculum, and today President Trump signed SUU’s proposed bill into law. Cedar City, UT, October 09, 2018 — For years, Southern Utah University’s Aviation program has worked toward changing an outdated Federal Aviation Administration (FAA) regulation for aircraft maintenance training curriculum, and today President Trump signed SUU’s proposed bill into law. The Aviation Maintenance Technician School Training Program Modernization bill, included in the FAA Reauthorization Act, will now allow SUU to update the antiquated 56-year-old curriculum. SUU’s Aviation program will teach current and relevant information that coincide with future airman certification standards and better prepare students for industry jobs. SUU is the first university to ever make changes to FAA regulations. SUU had support from the Aviation Technical Education Council (ATEC) and Senator Orrin Hatch (R-UT). Hatch introduced the bill earlier this year, then recently pushed for it to be included as an amendment to the FAA Reauthorization Act. SUU will now be allowed to utilize the method of credit hours in lieu of seat time requirements, will be able to teach with modern, advanced technology, and will encourage workforce development so the transition from graduation to career will be smooth and efficient. “With the updated rule, SUU Aviation can build the most modernized training for AMT that has ever existed in a public institution, which is what we plan to do,” said Britt. 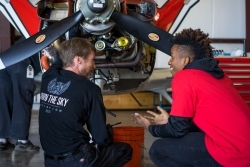 SUU Aviation hopes to implement the new curriculum with the next round of freshmen beginning classes in fall 2019.